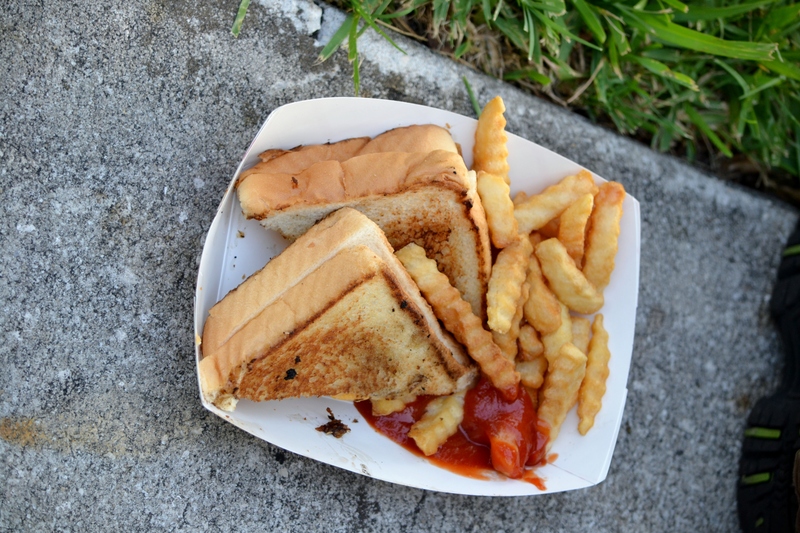 It’s another Tuesday night at Lake Lily in Maitland, FL for another Food Truck Cafe. Tonight I got to introduce my Dad to the Food Truck Cafe and bring along my little guy to part take in the fun. The concept is picking up as you can tell the crowd is growing each week but it’s a good mellow crowd. Lake Lily is a great venue for this event with lots of room, a lovely view, and plenty of places to find a seat in the grass or near by bench. 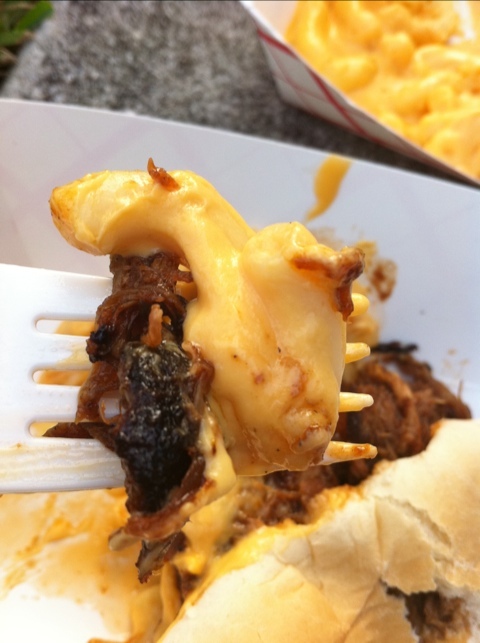 The most kids friend food can be found at the Red Eye BBQ truck. 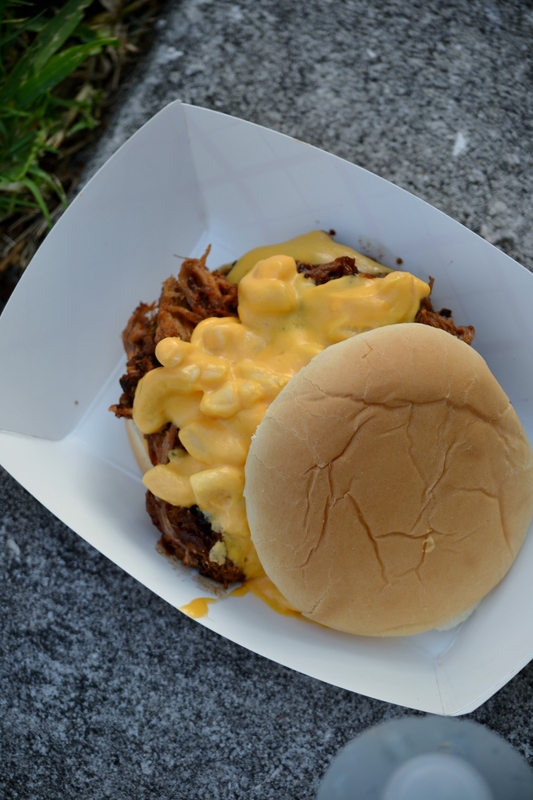 Here is a look at their menu and their delicious Big Daddy Burger with a burger, pulled pork, and mac and cheese all stuffed between a bun. If it isn’t messy it isn’t good right? 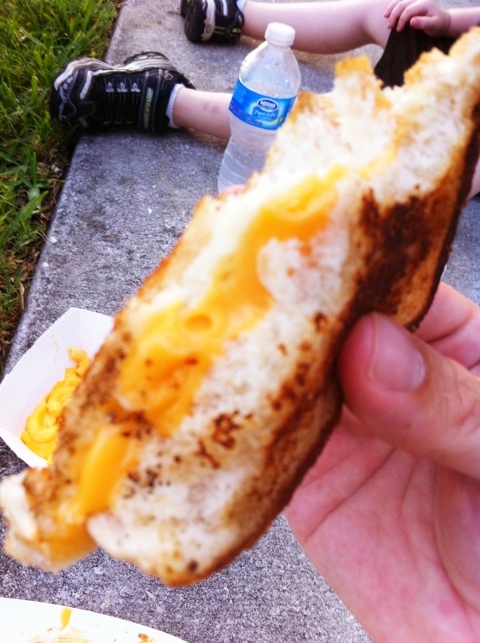 One of the items on the menu that is kid friendly includes the Texas Toast Grilled Cheese, which was very good cheese sandwich. My son loved the mac and cheese too! He almost eat the entire plate. This week time I skipped the Yum Yum Cupcake Truck (I know what was I thinking?) 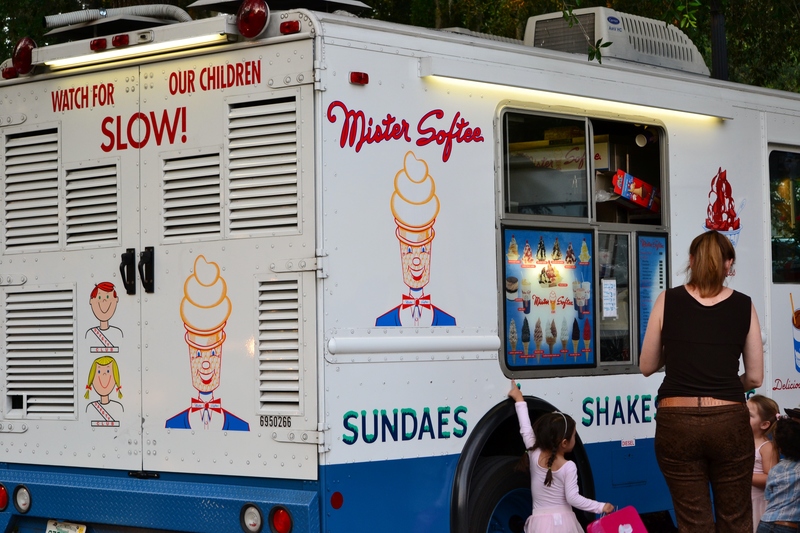 and went for the Mister Softee Ice Cream Truck. I decided to try the vanilla ice cream chocolate dipped cone and my son went for the chocolate ice cream dipped in sprinkles (as you can see plastered all over his face). 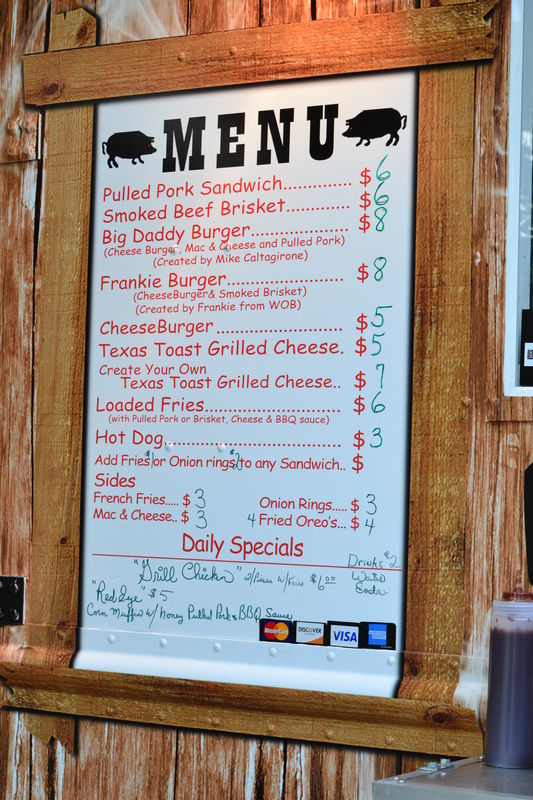 There was a newbie at the Food Truck Cafe – Winter Park Fish Company who has a very limited menu of 3 different items. By their new alone you can tell they have all fish related items. I’m not really a fan of fish but I’m sure if you are in the mood for fish taco they would be an excellent choice. 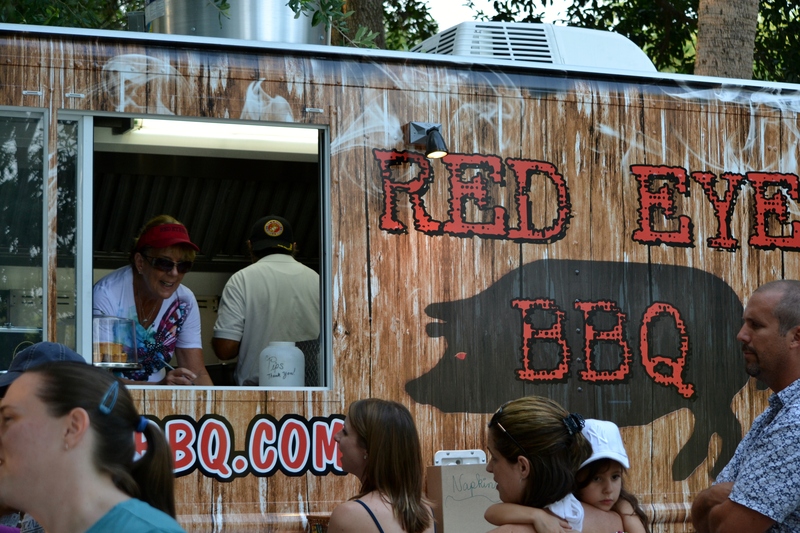 Don’t forget the Food Truck Cafe happens every Tuesday night at Lake Lily Park in Maitland, FL from 6 p.m. until 9 p.m. Most of the trucks take credit card through iPad mobile swipe programs but bring some cash just in case.